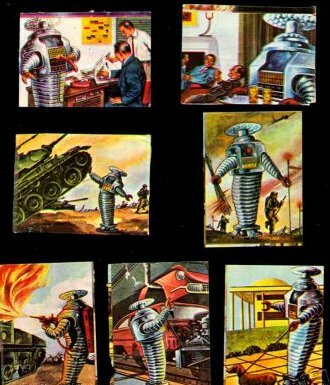 LOST IN SPACE ROBOT Mexican Cards. Full set of seven 2 x 2 1/2" cardboard cards featuring beautiful pictures from the LOST IN SPACE ROBOT. Blank on the back. The cards were issued in Mexico in the 60's by "Publicaciones Especiales". They are in very good condition. They shows some wear and creases, small rubs and scrapes. Two or three of the cards are misscut and off centered, but those are factory deffects. This set is very scarces, and the first time they have been seen here on the internet for fans and collectors to see. It is unknown how many of these were made and still available in today's market place?